Jacob is a food rescue coordinator who joined Lovin’ Spoonfuls in 2016. Every Wednesday at 11:30 AM, a Lovin’ Spoonfuls truck pulls up a narrow residential street in Dorchester’s Fields Corner and stops in front of an apartment building. The building is nondescript, it looks a lot like the rest of the brick buildings on the block, but inside is a shelter run by nonprofit Heading Home, which offers transitional and emergency housing to families facing homelessness. 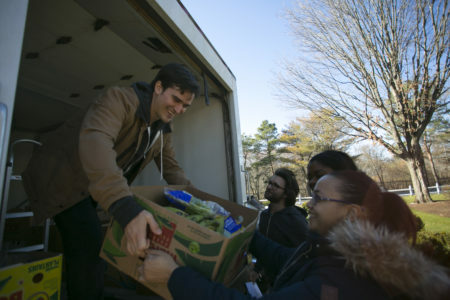 The truck unloads three or four boxes of fresh fruits and vegetables, a couple of boxes of bread and baked goods, some prepared salads and sandwiches, some milk, a box of dairy items – mostly yogurts — and a box of frozen meat. The food is quickly taken inside to a kitchen where it is separated, sorted, and distributed to the several families living at house. Food insecurity does not exist in a vacuum. It exists alongside of a myriad of concrete, material uncertainties. It is rooted in an economic reality that makes necessities like housing, healthcare, childcare, and access to sustainable employment opportunities inaccessible and unpredictable for so many while simultaneously providing a sense of security in these things for a few. Lovin’ Spoonfuls partners with organizations like Heading Home who confront these realities on a daily basis and work to offer security for those facing uncertainty. As partners, our responsibility is to target and reduce one aspect of precarity by reliably providing a high-quality supply of food that our partners can count on from week-to-week. When I describe my job as a food rescue coordinator to people unfamiliar with Lovin’ Spoonfuls, it sounds simple — we bring fresh, excess foods that would otherwise go to waste from grocery stores, farms, and wholesalers to places like shelters, food pantries, and community centers. Food rescue sounds pretty cut and dry. But to really confront food insecurity, and to create equitable and sustainable relationships with our community partners, food rescue has to be organized, predictable, and consistent. It requires well-thought out schedules that are geographically reasonable and connect people to culturally-relevant foods. 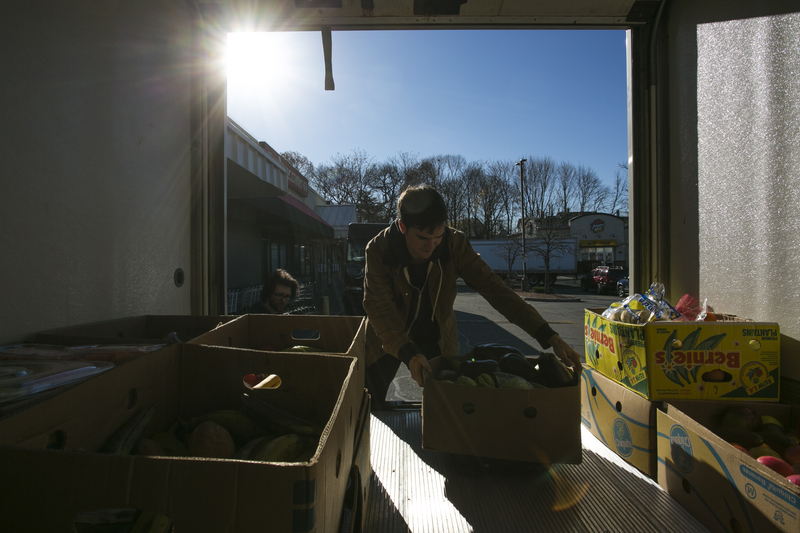 Our days have to be planned to suit our partners’ needs – we want to bring food exactly when it makes sense for our community partners, and we want to rescue food when it makes the most sense for our vendors. Our daily food rescue schedule has to be compatible with the schedules of multiple organizations’ that have diverse, and often divergent, needs. Overcoming this challenge is a seemingly mundane aspect of Lovin’ Spoonfuls’ work, but when we are successful, it results in a consistent flow of healthy, beautiful foods to our partners from week to week. When we are successful, we reduce uncertainty. If you take a look back through prior “From the Driver’s Seat” blog posts, you’ll find a common theme: this team is unwavering in their dedication to bringing the right food to the right people. When we are presented with a box of food at a farm or grocery store, we quickly know which partner organization can use the food, and we do our best to direct the food in a way that best serves our respective partners’ mission. What we do not want to do is show up to a community center one week with frozen meats, the next week with pre-made sandwiches, and with a box of cut-up pineapple the next. We do our best to diminish uncertainties, rather than exacerbate them, by keeping a tight schedule and working closely with our partners to learn their specific needs. As such, our partners are increasingly building their programming around the food that we drop off. They are building their schedules around us, and building food programming around the food we rescue. This can only work when they can consistently predict what we’ll be bringing to their door and when we will be bringing it. Not only do we strive to be predictable, we strive to provide our partners with the ability to choose which foods best serve their needs from week to week and we share in the serendipity of food rescue with our partners. When our partners need cut-up fruit for their afterschool programs, we don’t force them to accept a box of artichokes because we happen to have an abundance of artichokes on the truck. Rather, we organize our routes in such a way that we know when we will likely rescue cut-up fruits and boxes of artichokes and plan our distributions accordingly. While we work hard to provide consistency, food rescue can be unpredictable. When it is, we share in the surprises. A box of treats – cupcakes, candy, and ice-cream makes its way to a shelter that happens to be having a birthday party for one of the children in the home; a 50 lb box of ground beef is distributed to a community center that happens to be having a cookout the following weekend; and a farmer calls our office to donate 75 fresh turkeys just days before Thanksgiving. These are the most exciting moments of food rescue, and we are happy when the food we rescue can make a special experience that much better. Consistency may not seem like a very exciting story, but it’s what makes Lovin’ Spoonfuls work. It allows our partners to rely on us to walk up to their doors with fresh food choices on the same day, at the same time – every week. Predictability creates trust, and trusting partners can work together to confront and reduce the uncertainty surrounding food insecurity. Consistency also allows us to build relationships with our vendors, who can rely on us to be on time and to rescue as much of their food waste as possible during every visit. It is a critical aspect of what we do, and it is our main concern when we are on the road. Life is precarious for a lot of people. Access to food itself is precarious – even in places that are situated in seemingly endless abundance. We have a responsibility to address this material reality by doing everything in our power to maintain consistency.